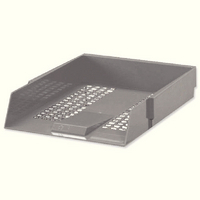 Pack of 1 letter tray. Colour: Grey. Approx Dimensions (CM): D34 W27.5 H5.5. Approx Weight (KG):0.2451.